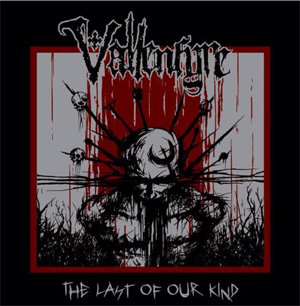 KNAC.COM - News - VALLENFYRE To Release Exclusive Tour 7"
VALLENFYRE will release a new 7" single, entitled "The Last Of Our Kind", in time for the North American Decibel Magazine Tour with their Century Media label-mates AT THE GATES, plus CONVERGE and PALLBEARER. Side A will be the previously unreleased title track and side B will be "The Great Divide", which was previously only available as a Decibel flexi disc. The cover artwork was done by Brian D'Agosta, who also created the art for the band's Splinters album. What started in late 2010 as a project by PARADISE LOST guitarist Greg Mackintosh soon became a real band: VALLENFYRE. Their 2011 debut album, A Fragile King, was hailed as one of the best death metal albums of the year, and the band took their signature crusty-death-doom even further with their latest album, Splinters, which was recorded and produced by Kurt Ballou (CONVERGE, BLACK BREATH, BEASTMILK, etc.) in Salem, Massachusetts. On the Decibel Magazine Tour, Greg Mackintosh (vocals) and Hamish Glencross (guitar) will be supported by live guitarist Sam Kelly-Wallace and live drummer Waltteri Väyrynen, who already played with them on last year's tour with BOLT THROWER and the "Splinters Over Iberia Tour" in early 2015. VALLENFYRE drummer Adrian Erlandsson (AT THE GATES, PARADISE LOST, THE HAUNTED) can't do two shows every night and decided to play only with AT THE GATES, while bass player Scoot already had a commitment to play a South America tour with DOOM [Scoot will be replaced live by Alejandro Corredor from NAUSEA (LA)]. Before VALLENFYRE flies over to the USA, they will play Blastfest in Bergen, Norway this upcoming weekend (also with AT THE GATES and other label-mates such as ASPHYX, BORKNAGAR, DARK FUNERAL, DARK TRANQUILLITY, FINNTROLL, MOONSORROW, MORGOTH, PARADISE LOST, WATAIN). The band will also appear at summer festivals like Hellfest, Graspop and more. See below for all upcoming dates.